Lina Gebäck, Cofounder of Linas Matkasse, (Linas Groceries) a Swedish company who delivers food directly to people’s door. Linas Matkasse is also one of IAS business partners and in January 2014 Linas together with 30 employees came with IAS to Kenya. – Since four years ago we offer our customers something that we call Kenyakassen (the Kenya Food Basket). Each customer is able to sum up to the nearest hundred swedish crowns and that ‘extra’ money goes directly to our projects in Kenya which aims to help poor families with food and supplies. We who are responsible for the project have visited the project in Nairobi and Tharaka several times before and now we wanted more of our colleagues to see what difference Linas Kenyakasse makes in people’s lives. You visited the slums of Kibera and Mukuru. How was it to see the work on ground that you are engaged in? – It was a shock to all of us who had never been in the slums before. To see so much misery and at the same time meeting so much joy and love is a bit of a shock to us “moderate swedes”. When we stepped out of the bus to meet the first self-help group that we support with food in Kibera, they came dancing towards us. We were very touched of the love they showed us! You visited a school where you participated in painting classrooms and cooking lunch for the kids. How was it? -It was a different experience cooking outdoors without a kitchen. 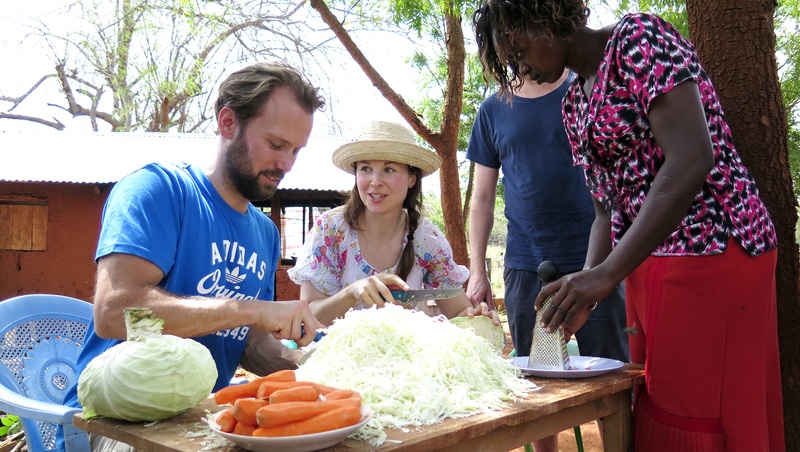 Together with the women in Tharaka our team cooked a stew with goat together with rice and vegetables. The women thought it was strange that even the guys were helping out with the cooking and they had a good laugh about it. And to serve the kids was so great! All of us wanted to stay there to be able to give them lunch next day as well. During the trip Linas Matkasse launched a new project that provides fruit as a snack for school children. Tell us about it! – The principal at Ntuja primary school told me that his students usually only get one meal a day and sometimes they faint from malnutrition. With one fruit a day they at least get a snack that we hope will give them energy to learn more. The fruit is bought from local farmers which in turn increases the demand for fruits which will provide more jobs. What lasting impressions did the trip have on you and your colleagues? – The enthusiasm about our Kenya Project has increased and is still with us in our daily working life. The trip showed me that our support actually reaches people! Now we are many who run this together and many employees of Linas Matkasse have ideas about how we should move forward to help even more people. Everyone of us wants to do more!